Earlier this month, Clinton County commissioners held a joint meeting at Liberty Township Hall with the township trustees there. Liberty Township is working on removing overgrown trees in the rights-of-way and cleaning up trash on roads in a partnership with the Clinton County Juvenile Court Probation Department. 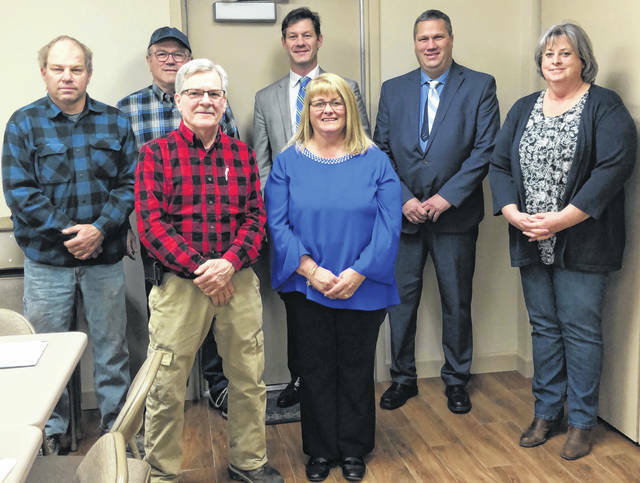 From left are Liberty Township Trustees Ron Stryker, Gary Mason, Richard King, Commissioners Kerry Steed, Brenda Woods and Mike McCarty and Liberty Township Fiscal Officer Beth Hadley. Commissioners continue to hold their on-the-road joint meetings at municipal or township meetings. Upcoming joint meetings will be 6:30 p.m. Monday, March 25 at Clarksville Village Council (at 205 W. Main St. in Clarksville); Monday, April 1 at a Board of Chester Township Trustees meeting; and Wednesday, April 17 at a Board of Union Township Trustees meeting. Residents are encouraged to attend the meetings.